I praise God and forever grateful to Him for saving me and healing me from breast cancer. The greatest miracle is my salvation. I came from a very strong Catholic background and there was no way that I would change my faith but Jesus did it all for me. I had my left breast already removed because of this dreadful disease and underwent several chemotherapy to stop the spread of the virus that resulted to excessive lost of hair. I was already bald and just wearing a bonnet to cover my head every time I go out of my house. I was so ashamed and frightened of my situation knowing that my life is already numbered and that cancer has no cure from the medical science. I was desperately hopeless and just waiting for the time that death would take me. Until such time that one of the members of the King’s Revival Church International invited me to attend their Friday Miracle Healing & Deliverance Service and assured me that Jesus is able to heal me. Pastor Dilkumar has prayed over me and rebukes the cancer from my body in the Name of Jesus Christ. I felt nothing exciting but tears flows from my eyes because I felt the love and compassion of God through that wonderful name of Jesus. I left the service with a hope that I will be healed. I started coming for the other services also. I was scheduled to go for the other operation of my right breast because the doctor has diagnosed that it has already spread out and the right breast has to be removed. By faith, I did not go for the operation. I stood in the promises of God that “by His stripes, I am healed”. Now I am testifying to all, I am completely healed from breast cancer. My right breast is intact and no more sign of cancer disease. And my hair started growing and now I have a very thick and black hair. All glory to Jesus Christ. Four hospitals here in Dubai have diagnosed me having “cancer in the uterus” and immediately advised me to go to Al Tawam Hospital in Al Ain for immediate operation since I looked 6 months pregnant because of the growth of cancer inside my stomach. I was so depressed, hopeless after receiving the reports from the hospitals. Someone from KRCI told me “Jesus heals even now”. Then, I decided to attend the Friday Miracle Healing & Deliverance Service in the church before going for operation. A word of knowledge came from the servant of God that Jesus through the power of His Holy Spirit is healing those with cancer. I stood up crying and claiming every spoken word in the name of the Lord. I felt peace within me that very moment, and the fear of cancer has vanished away.Two days later I went to Al Ain for the operation believing that Jesus has healed me, since I receive His touch the previous day. “Total abdominal hysterectomy” (means removal of uterus, fallopian tube & ovary) was performed, yet the doctor has not guaranteed complete removal of the cancer. They told me to go back for further Chemotherapy, but I did not go back anymore, because I believe Jesus has already healed me. And when I went for my check up, the prognosis report is very good and shows no more trace of cancer. The doctors were amazed and asked how could it be. I smiled and said, “God has healed me”. I give all the glory and praise to our Lord and Saviour Jesus Christ. Now I am rejoicing than ever before, because not only that I am healed, I am also SAVED by His grace. All glory to Jesus Christ the Son of God. I praise God and forever grateful to Him for healing me from “Nasal Cancer”. I was diagnosed in one of the hospitals here in Dubai having Nasal cancer and advised to be operated immediately. My best friend who was healed from “cancer of the uterus” when prayed by the Servant of God of this church has told me to come to KRCI and be prayed in the name of Jesus. For Jesus is the only one that can heal my sickness. I was first prayed by Filipino sisters in my place and led to salvation prayer. They invited me to come for the Friday Miracle Healing & Deliverance Service to be further prayed by Pastor Dilkumar, an anointed servant of God. It was revealed through the power of the Holy Spirit that the “very root of the cancer is now drying in the name of Jesus”. I felt the power of God all over my body, and from that time on I have peace in my heart and faith is built up that Jesus will heal me. I left for Philippines few days after I was prayed over believing that I am healed already in Jesus name. When I reached Philippines I immediately get my self examined to the hospital and excited to know the result that I am already healed in Jesus name. After thorough examination and blood test was carried out, the doctor assured me that there is no need for operation. No cancer disease is detected from my nose. I praise and thank God. My expectation of healing is indeed granted. Thank you Lord Jesus. A word of knowledge came from the servant of God during a Friday Miracle Healing & Deliverance service about a “Urinal infection” being healed in the name of Jesus Christ by the power of the Holy Spirit. Since my first report from the doctor confirmed that I have such disease, I bow down and claim the healing in Jesus Name as He promised me in His word (Exodus 15:26) saying “I am the Lord that healeth thee”. When I went back to the doctor for the second test the report shows no trace of urinal infection and everything is normal. Praise the Lord for my instant healing. I am Sam Lawgray, I was suffering from wheezing since I was one and a half years old. I used to get this asthmatic attack every now and then (and I used to keep a bucket near my bedside for vomiting). My parents tried all kind of treatments, but all in vain, even doctors asked to take at least two tablets a day along with the inhaler. My parents were very upset as doctors told there was no permanent cure for asthma and that all medicines had great side effects. Two months later on Friday morning during the Miracle Healing & Deliverance service, Pastor Dilkumar prayed for people like me suffering from asthma, and asked to keep our hands on the chest. I did so. From that day onwards, my mummy stopped giving me tablets, even though she knew that I would not be able to walk for more than 10 meters without taking them. Thank God! The attack did not come back. Now, for the past two years I am living without taking any tablets anymore. Great God has healed me completely. I thank my Jesus for answering my request. A lump on the groin region, which was diagnosed as “Lympforma (a type of cancer) by Regional Cancer Institute in India, was completely healed by the Lord Jesus Christ after I was prayed over by the servant of God during the Friday Miracle Healing & Deliverance Service, at King’s Revival Church International. I wept uncontrollably, because I felt the love of God penetrating over my sick body. I believe that Jesus healed me on that very moment when I felt the unusual experience. All doctor’s report and tests showed negative. No signs of cancer were traced from my body. I praise the Lord Jesus Christ for this great miracle of healing and His loving touched. Jesus Christ our great healer. I will praise Him as long as I live. All glory to His Holy Name. I thank and praise God for the miracle healing in my body. For 3 years, I had continuous internal bleeding. I took medicines, but the condition became worse, I was nervous and frightened. 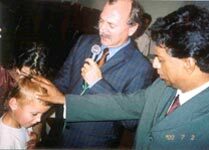 But as I believed in the Lord Jesus, during the service Pastor Dilkumar through the power of the Holy Spirit called out my sickness, and the power of God went through my body and I was healed instantly and completely. Praise be to my Saviour and Healer Jesus Christ. God is indeed no respecter of any person. Though I am from a Roman Catholic background yet when I cried out to the Lord in the name of Jesus Christ and believe on Him, I received His loving touched and healing. I am healed from a “Fluid Oozing out” disease that was undiagnosed and no name yet given to it or no medical terms. Due to this sickness, I was loosing weight and could not work properly which resulted to the termination of my contract. The company finally cancelled my visa and sent me back home to India. Before I left Dubai, I was led by someone to be prayed by the humble servant of God at the King’s Revival Church Int’l. during their Friday Miracle Healing & Deliverance Service, and a word of knowledge came from the servant of God saying that God is healing and delivering me from my disease. I left Dubai believing that God has healed me.And when I reached India I found out that I was completely healed. After three months of receiving a touched and healing from the Lord Jesus Christ, the Lord brought me back to Dubai with wonderful blessings of new job, double the previous salary, with accommodation and on employment visa. Glory to the name of Jesus Christ. I love you Lord. “Migraine headache” from childhood that has disturbed my studies and work is now healed in Jesus Name. Twice a week I have to vomit due to migraine headache but now I am healed when a Word of Knowledge came through Pastor that Jesus through the power of His Holy Spirit is healing “Migraine headache. I claimed it and cried to God, Lord let it be me. From that very moment till now no more headache and vomiting. God healed me completely. Spondalytis, neck cramps, hand pain – could not lift telephone. Went to the doctor, but due to financial difficulties could not go for further treatment. Came to KRCI during Friday Healing & Deliverance Service, when a “word of knowledge” came from a Servant of God, saying that neck cramps and spondalities is being healed in Jesus name. I claim it and realized later that I don’t have pain anymore. I am completely healed in Jesus Name. 8 years suffered from knee pain. Last Sunday service through word of knowledge prayed for knee pain and received healing instantly. 20 years of disease - healed by Lord Jesus. I was suffering from ulcer for more than twenty years. I attended many hospitals for treatment, no doctor cure it. Swollen and biting leg started this year. No doctor could cure it too. Eye problem started about ten years ago, many nights I could not sleep because of the ulcer and biting leg. Despite these I still believed that God almighty will heal me, I solely believe in Him according to HIS word in 1st Peter 2 :24 "By His stripes we are healed". God is so good and merciful I have all reasons to praise and thank Him, I was healed on a Sunday service when the visiting Pastor Dillkumar during the prayer gave a word of knowledge : "There is a women here, a widow' who suffers form swollen leg, ulcer & eye''. From that moment my ulcer had gone, Biting and swollen leg is not as painful as before. I am very very happy and grateful to god for my healing I will praise him and sing praises unto HIS name. For 8 years I was suffering with growth of cancer in my uterus. I was only trusting my God to heal me, give me life. During the Miracle Service my amen was called out by Pastor Dill and I felt the power of the Holy Spirit filling me and I knew something was happening inside me. That night as I returned home the lump cancerous growth fell off my Tress and now I am healed completely in Jesus name. I praise and glorify God for His grace and mercy, during the service Pastor said, "'diabetics is gone in the name of Jesus " I believed and thought it is for me as I was suffering from diabetics for 20 years. When I went to check my sugar count, it was normal. I thank God for healing me. I give all glory to God for instant healing. On 26 Jan 2003 (Sunday) was the first day I attended King's Revival Church. For the last 5 years I had terrible pain on my Knuckles and I was not in a condition to tolerate even a mild touch. during the service I was instantly Healed and all the pain vanished totally. Now I can touch & move my Knuckles without any pain. I was suffering with nose bleeding from my young age and has caused lot of pain in my body as well. During a Friday miracle healing & deliverance service the power of God came upon me and I was healed instantly. Praise be to God 'who lives forever whose name is holy' Isaiah 57;15. for the wonderful miracle he has done in our lives When l was seven months pregnant on the 25th of December l visited the hospital for normal checkup. At the hospital my baby was found to be distressed' and her heart beat was failing due to my high blood pressure. The doctors said that l could loose my child at any minute I was rushed to the labour room and was told my pregnancy was to be terminated and that the survival of my child could not be guaranteed since the baby was very small. l was naturally very disturbed at the thought of loosing my baby after all I had been through. The doctors very words were "you are loosing your baby anyway so let us take a CHANCE". When the doctors told me this there was on one with me, but l remembered my God who said in his word "call upon me in the day of trouble l will deliver you and you will honor me" psalms 50 : 15. I promised God that if He would save my life and the life of my child, I would give him all the glory and that I would testify to His name wherever I go. The whole assembly prayed to our God during the service on that 25th night Surely the arm of the lord is not too short to save' nor his ear too dull to hear' Isaiah 59;1 He heard our prayer. Our daughter was born that night weighing only 1 Kg. .She had a neonatal convulsion neonatal sepsis, respiratory distress and other complications at birth which are recoded in her health report. We don't' understand much about these complications. Jesus heals and restores life to my Husband. Last Friday my husband was declared clinically dead due to heart attack. As I cried out to Jesus in faith my husband's life was restored. Again on Sunday 15.9.2002 he got chest pain and was rushed to the Hospital. I decided to leave him in the hands of the Lord Jesus Christ, and came to attend Church Service believing God will heal him. My faith healed my husband completely, all praise and glory to God. 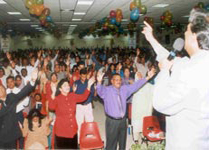 l regularly come for Fridays & Sundays for the healing and deliverance prayer at Kings Revival church Dubai since 4 months. 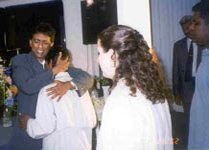 My wife & me are born again, baptized and came into faith on 23rd July 2002. Pastor prophesied during one of the sessions saying, "There is a person here who is forgetful and is on medication. The person also suffers from insomnia and God is healing this person right now"
It is so amazing to testify God's Healing power. Was suffering from terrible Diabetics since 1997 and was on medication since then. Recently I gave my life to Jesus Christ and accepted Jesus Christ as my personal saviour and obeyed the Word of God and went into waters of baptism, My heart was filled with joy and happiness. On the very next Sunday word of knowledge came through pastor saying; 'someone is being healed of Diabetics, I took this word in faith and left the church rejoicing. To confirm this healing I went for a check-up and the Doctors told me I don't have Diabetics any more. I was so amazed and I went again for a second medical check-up, Alas! There is no trace of the DIABETICS IN MY BODY, all praise, honor & Glory belongs to the Lord Jesus Christ. My son was suffering from 'URINE INFECTION'. We were on the way to Al Wasl Hospital (Dubai) on Friday Morning (11/10/02). While still on the way, we have decided to come to the Church rather than to the Hospital. Then the word of knowledge came through Pastor saying "Someone's Urine Infection is being Healed" We took it in faith and to confirm it we took him for a medical check-up and found he was completely healed. All praise and glory to Our Lord and Saviour Jesus Christ. BEFORE I was healed from “Breast Cancer”. Wearing bonnet to cover my baldhead because of chemotherapy. AFTER the Lord Jesus Christ healed me. No more trace of breast cancer. My right breast is intact, my hair started growing, its black and thick.